7:30 PM John Scofield "Combo 66"
Set in a fantastic location in the heart of Chelsea, just minutes from Sloane Square tube station, Cadogan Hall has become one of London's leading concert venues. 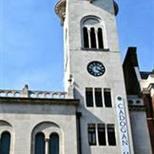 Cadogan Hall is located north of Sloane Square, on Sloane Terrace adjacent to the junction with Sedding Street. General rules - No video cameras or recording devices allowed. - No food or drink to be taken into the venue. - No Smoking is permitted anywhere in the building. Sloane Square Station Upon exiting Sloane Square Station, turn immediately right, passing the Royal Court Theatre. (You will see Cadogan Hall's tower immediately before you). Cross over Cliveden Place and walk up Sedding Street to the Hall. Victoria Station onward by tube to Sloane Square. You are advised not to travel to Cadogan Hall by car - on street parking is limited and strictly controlled. Please use public transport. Frequent bus services stop in Sloane Square and neighbouring streets including King's Road, Sloane Street and Lower Sloane Street. Bus services include numbers 11, 19, 22, 137, 211, 319, 360 and C1. A limited number of bays are available on Sloane Terrace, Wilbraham Place and Sedding Street after 6.30pm. Please check street signs for details. The nearest National Car Park is less than six minutes walk from Cadogan Hall at Cadogan Place (underground car park) just off Pont Street, SW1X 9SA. The car park operates Monday to Sunday and is open 24 hours. The venue has a range of services for disabled customers including access lifts to the foyer bar, stalls and toilets. The Box Office counter is fitted with a loop system to aid customers with any hearing impairment. The auditorium is fitted with an infra-red amplification system. This is not the same as a Loop System so switching your hearing aid to 'T' is not sufficient. You will need to use an amplification aid. Guide dogs are welcome to access the Hall and auditorium but please let the venue know prior to arriving, so they can make any special arrangements if necessary. For further information, please contact 0207 730 4500.